The US-100 is a USB 2.0 device. 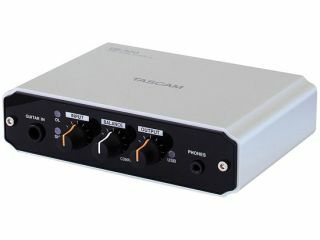 PRESS RELEASE: TASCAM has announced the US-100, a new USB 2.0 audio interface positioned at a breakthrough price. The high-quality interface features a microphone input as well as instrument level input for direct recording guitar or bass. Stereo line inputs are provided, and can be switched to phono-level to connect a favorite turntable to digitize a vinyl collection. All of this is housed in a solid aluminum chassis to withstand any abuse from the road to the dorm room. The US-100 is a 48k/16-bit stereo audio interface that connects to a Mac or Windows computer using USB 2.0. A free copy of Audacity® software is included to start recording right away. Additional features like a 1/8" stereo headphone output and zero-latency monitoring make the US-100 perfect for songwriters and musicians getting started with recording. TASCAM's US-100 will be available from TASCAM retailers in September at a street price under $100.